Will Bond in “Chess Match No. 5,” which is about John Cage and was conceived and directed by Anne Bogart. For decades, Marcel Duchamp was busy “conspicuously playing chess, not visibly doing art.” Much the same happens in “Chess Match No. 5,” which quotes that remark by the composer John Cage about the conceptualist. The two people onstage are conspicuously playing chess; they also make toast, fiddle with a radio, drink tea and trade disconnected aphorisms and anecdotes. They are not visibly doing theater, if that means plot, traditional characters or singing cats. Except, of course, that they are. You just need to recalibrate your expectations, just as Duchamp made audiences recalibrate their expectations of art and the show’s subject, Cage, made them rethink music. 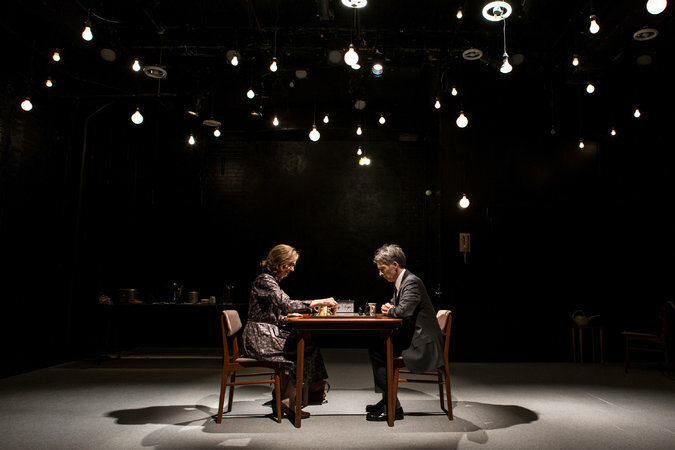 Conceived and directed by the longtime experimenter Anne Bogart, the SITI Company’s opaque, mystifying “Chess Match No. 5” is built entirely from Cage quotations, arranged by Jocelyn Clarke into an exploration of the artistic process that tries to mirror the subject’s own experimental practice. Ms. Bogart and Mr. Clarke took the same approach to the director Robert Wilson in “Bob” and the writer Virginia Woolf in “Room.” Like its predecessors, “Chess Match No. 5” is a cerebral peek into an artist’s worldview. Will Bond, displaying the impish smile of an eccentric scientist, and Ellen Lauren, whose deceivingly detached inflections recall Laurie Anderson’s, putter around the stage in a manner that feels aimless and deliberate. They also play chess, just as Cage and Duchamp did in a 1968 public game/performance. Ellen Lauren and Mr. 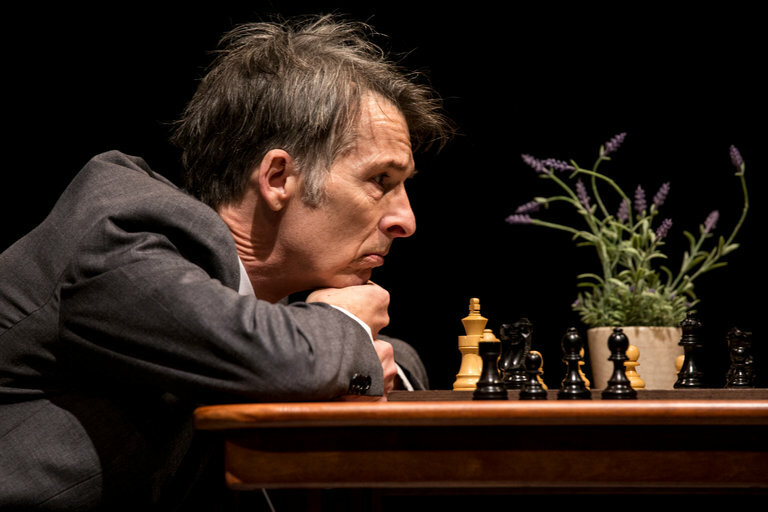 Bond play chess in this play based on John Cage quotations. “Chess Match No. 5” is part of a larger project, “Theater Piece No. 1” (the name of an early collaborative piece by Cage), that will involve contributions from musicians and choreographers. One suspects that Ms. Bogart is just as interested in making us think about what theater means and what we want from it as she is in the composer. The first precept may be to go with an open mind — and ears. Runtime 1 hr. and 30 min.